Three plays by J.B. Priestley which illustrate well his desire toexperiment. All three were written between 1938 and 1940, thoughEver Since Paradise was not produced till 1946. It was a very creativetime for him, but interrupted by the war. There are elements of hiscontinuing interest in Time in each of them.Music at Night centres on a group of people attending a musicalevening to hear a new work.… Each act follows a movement in the music,which inspires the listeners to react each in their own way, lookinginside themselves for their true feelings and sometimes rememberingsignificant moments from their past. As often in Priestley's work, therelations between the sexes play an important part, a theme whichrecurs in the other two plays. 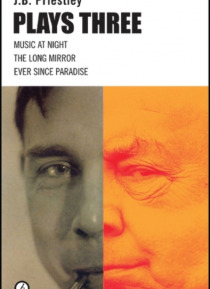 The Long Mirror recounts the meetingbetween a composer and a young woman who seems to have beentelepathically connected to him for some time, and has experiencedmuch of his life before actually meeting him. Her knowledge of hispast can help his future as an artist and a husband. It was based on atrue incident. Ever Since Paradise Priestley described as 'A DiscursiveEntertainment, chiefly referring to Love and Marriage, in Three Acts'.Three couples are made up of The Musicians, the Commentators and TheExample, and together they illustrate various aspects of relationships,accompanied by appropriate music on two pianos. None of the playsare truly conventional but are disguised as such. A fascinating trio.